Final post for this holiday and since it is cold again. I thought why not enjoy a glass of hot cocoa with a bit of green. 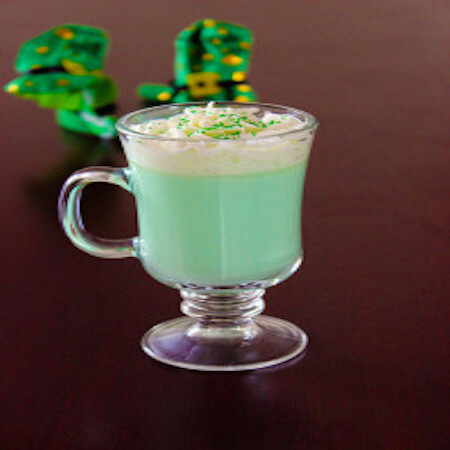 Here is another easy treat to make with the kids for St. Patrick’s Day. Chocolate and rainbows…how can you go wrong with those two words in the same sentence? Michelle Clausen at Sugar Swings! shows you how to make these colorful creations. Here are some cute and healthy lunches that would put a smile on any child’s face or adult. The Frugal Female shows you four different lunches that she found online. Have you ever had a poke cake before? It is a basic cake with holes poked in it and then you pour jello into the holes. It’s a yummy surprise, when you take a bite. This recipe does use Guinness beer, but the author stated you could replace the beer with strong black coffee. This recipe is also gluten, dairy, egg and soy-free.